Autism Awareness Day is recognized annually on April 2nd. The Autism Awareness Puzzle Ribbon is the universal sign of autism awareness. The shapes and colors represent the complexity of the autism spectrum and is used by many organizations to raise awareness. In efforts to raise public awareness and acknowledgment of the talents and abilities of individuals with autism, the United Nations (UN) first declared World Autism Awareness Day in 2007. Since the adoption of World Autism Awareness Day, other initiatives have come about, such as the “Light It Up Blue” campaign. Autism spectrum disorder (ASD) is a complex neurodevelopmental disorder characterized by difficulties in language development, social communication, and social interaction. Autism is considered a spectrum disorder as it affects each person differently and to varying degrees. Other disorders that fall under the autism spectrum are Asperger’s Syndrome, Pervasive Developmental Disorder, and Childhood Disintegrative Disorder. Recent reports show that in the United States, 1 in 68 children (1 in 42 boys; 1 in 189 girls) are diagnosed with ASD. Teachers need to understand autism and its effects on learning in order to better support the needs of students on the autism spectrum. Special education teachers and general education inclusion teachers can use the following instructional strategies to help their students with autism. VocabularySpellingCity provides learning resources for all learners alike. Our game visuals and printable worksheets are useful learning tools for students with autism. 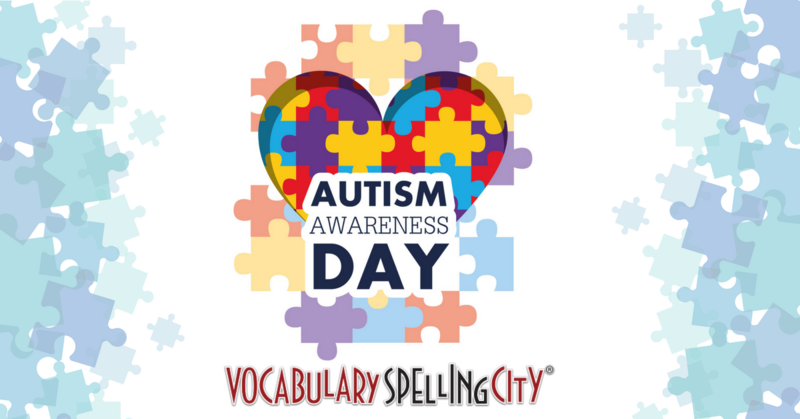 “My son, who is on the autism spectrum, loves VocabularySpellingCity. He has trouble with letter and number size and formation, so I gave him the printout in which you can trace the word. He’s so happy and has a renewed hope that ‘I can’t write’ will become ‘I can write.’ We are also using VocabularySpellingCity with our nonverbal 5-year-old. We take words we want her to learn to say and make a spelling list with them. When the game spells and reads it to her, she is starting to repeat the word. How cool is that? !” – Dana D.
Import a World Autism Day word list and pair with interactive learning games and activities to raise autism awareness.